Win your dream Spring Break or Summer Vacation including a $1,000 Hilton Hotels gift card to be used towards the purchase of a stay, room service, resort fees, etc. at any Hilton affiliated property worldwide, and 100,000 American Airlines miles for the one-time purchase of two, Business class or below, roundtrip tickets for any American Airlines destination in the United States. Jet off to the East Coast to spend Springtime in New York City at the world-famous Waldorf Astoria to watch Broadway shows! Get tropical at a luau on the Big Island of Hawaii at the Waikoloa Village Resort or snorkel in the pristine waters at the Grand Wailea Waldorf Resort in Maui! Watch live blues in Chicago while staying at the posh Palmer House or stroll Bourbon Street listening to jazz in New Orleans while resting your head at the upscale Troubadour Hotel! Golf at Boulders Resort & Spa in Arizona, windsurf at Baker’s Cay Resort in Key Largo, tour historical sites at Ames Hotel in Boston, all while traveling Business Class! Only 200 tickets will be sold! $50 per ticket! 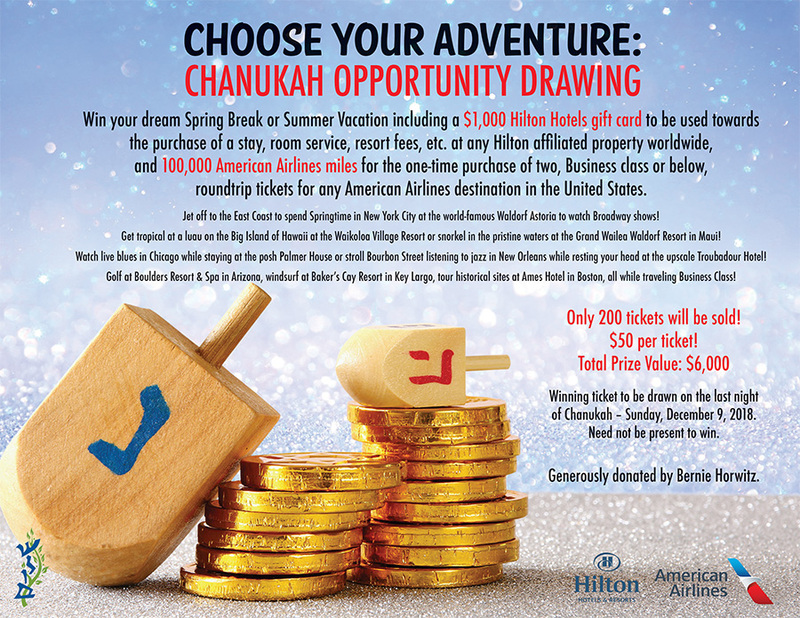 Winning ticket to be drawn on the last night of Chanukah – Sunday, December 9, 2018. Generously donated by Bernie Horwitz. or by filing out the form and returning it to the TBS office.